There is a new post at the Mile-Hi Cycle Guy site, about the first two rebuilt bikes we sold yesterday. Go here to check it out: http://www.milehicycleguy.com/blog/. Tomorrow is tha last day for this month’s poll. The results have been a bit disappointing, to say the least; with minimal response. We do these polls for fun, as well as for effect and education; so please respond with your answers. If they’re not serving their purpose, please let us know. If you have ideas for a new poll, please let us know. If you hate these polls, please let us know that too, and we will discontinue them. The most recent post is about bicycle commuting, the philosophy of bike commuting, and I really enjoyed it. Some exciting things are taking place around here. The new bicycle business is really beginning to come together. 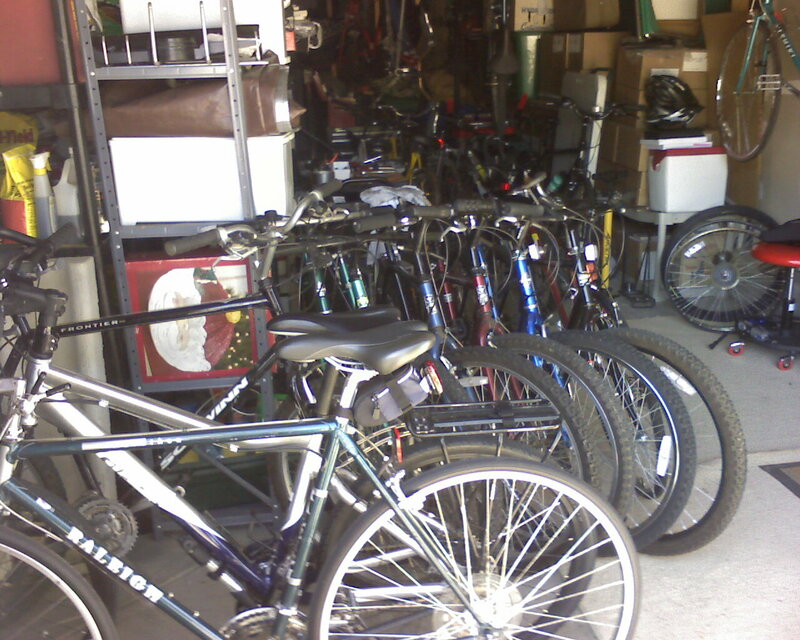 We have plenty of bikes to work on, along with the tools to do so. The rebuilding of the first few bikes is either complete or very close. In fact, we may have as many as six bikes available for sale this weekend. We’ve even launched a new website for it; www.milehicycleguy.com, since building, launching, and maintaining websites is something Andi does as part of her virtual assistant business. I’ll be updating this site with information from the other, and vice-versa, so stay tuned for more. Feeling a bit smug and self-satisfied recently, I posted some pictures of the bikes we’re working to “hybridize.” Only after hearing from an old friend on Facebook did I realize that most people have no idea what I mean by this. A hybrid bike brings together the best features of a mountain bike and a road bike. A hybrid bike has a strong, durable frame with an upright riding position (mountain), while still being quick and agile with a smoother, faster ride (road). It is a fun, comfortable bike to ride, whether commuting, touring or just spinning around the neighborhood. Had I known such a machine existed when I began riding a couple of years ago, I would have bought one for myself. However, I did not know, so I “hybridized” my own bike; trying a variety of different things to make it lighter, more comfortable, and faster. Ultimately, after many mistakes and mis-conceptions, I’ve spent about a thousand dollars on the bike I rode daily in Phoenix, and which I rode from Phoenix to Denver, to get it where I want it. Now, we are doing the same for others, at a much reduced cost from a new hybrid bike…and much more cheaply than I did it for myself. Mountain bikes are built with extremely strong frames to endure the pounding the bike will take when riding trails, as well as being geared for climbing hills. These features translate into greater confidence in the machine when an overweight, out-of-shape person (like me) wants to return to, or begin, riding for exercise, weight loss, and commuting. Also, the more upright riding position of a mountain bike looks, and is, more comfortable than the more aggressive, more aerodynamic position of a road bike. After all, who wants to spend time pedaling a bike while bent forward over the handlebars with one’s belly being pounded by one’s thighs? However, there are problems in using a mountain bike for commuting or for exercise. They can be very slow and the ride can feel rough, due to the large knobby tires designed for trail riding. They can also be rather heavy and feel sluggish when riding on roads. A mountain bike also tends to receive a great deal of abuse. So, while a mountain bike can be fun to ride on trails, it is the very things which make it so which also makes it a poor choice for riding streets. Road bikes on the other hand, by definition, are great for street riding . This is what they are designed to do after all, and they serve their purpose very well. They tend to be very light, very quick, very fast, and very agile. They can be incredibly fun to ride, even the older models. However, a road bike tends to feel awkward and uncomfortable to the novice cyclist, making the riding experience a chore rather than being enjoyable. The riding position alone can frighten the novice rider, not to mention the price of a high quality road bike. Further, road bikes are geared for speed, not climbing, and so do not have the gearing a novice needs to climb even the smallest bumps in the road. These features, which make a road bike so much fun to ride for an experienced cyclist, are things which tend to make someone new to cycling turn away from a machine which can provide years of exhilarating riding. Bicycle manufacturers, always innovative and always ready to adapt to new trends in cycling as a means to increase sales and profits, have understood these problems with the two most popular types of bikes for quite a while now, but have done their usual poor job of educating the public about the products they offer. The machines which are being built today are remarkably well designed and efficient, yet the general public has little or no idea of what is available. Further, the cost of a new, high quality bicycle can be very intimidating. For the novice or returning cyclist, cost is definitely a factor. If riding is not a pleasurable experience for them, that new bike is nothing but money down the drain. If they don’t enjoy the new bike, they will not use it and the exercise and weight loss goals they set for themselves will never be realized. A good quality mountain bike will cost $500-$1000, or more. A good quality road bike will set you back $1000, at least. Even a quality hybrid will usually be half-a-grand. Frankly, the numbers scare people. I know, because they certainly scared me, and still do. So, what is the solution for the novice or returning cyclist? Buying used from a stranger can be just as frightening, even though the investment is much less intimidating. Plus, you still have the problem of which type of bike to choose. Mountain and road bikes do not, and never will, serve the needs of the novice cyclist. We believe a rebuilt, hybridized bike to be the answer. A decent bicycle can perform its function for not just years, but decades. Bike frames last a long time, even when abused. They may not look as pretty as they did when new, but they serve their function remarkably well. The components on the other hand, i.e, the stuff that is hung on the bike to make it go, can really suffer from neglect. The drivetrain alone, when ignored, can make a bike impossible to ride. The gears up front (the chainrings), the gears at the rear (the cassette or freewheel), and the chain (the chain), can become rusted and frozen, making the bike un-rideable. Even the simplest maintenance of these items will make them last nearly as long as the frame but, for someone who doesn’t enjoy using their machine, these simple tasks become meaningless, and useless. Replacing these items on an old bike can be expensive, literally costing more than the bike is worth. So, we don’t replace them. We clean and rebuild them. Whenever possible, we rebuild the components of the bikes we find which allows us to keep the resale price at an acceptable level. After all, it only costs us time to do this, not cash, and our reward is in making an old bike shine. We also clean and re-pack all the bearings on the bike; in the headset (the steering), in the bottom bracket (where the cranks turn), and even in the wheel hubs (the axles). 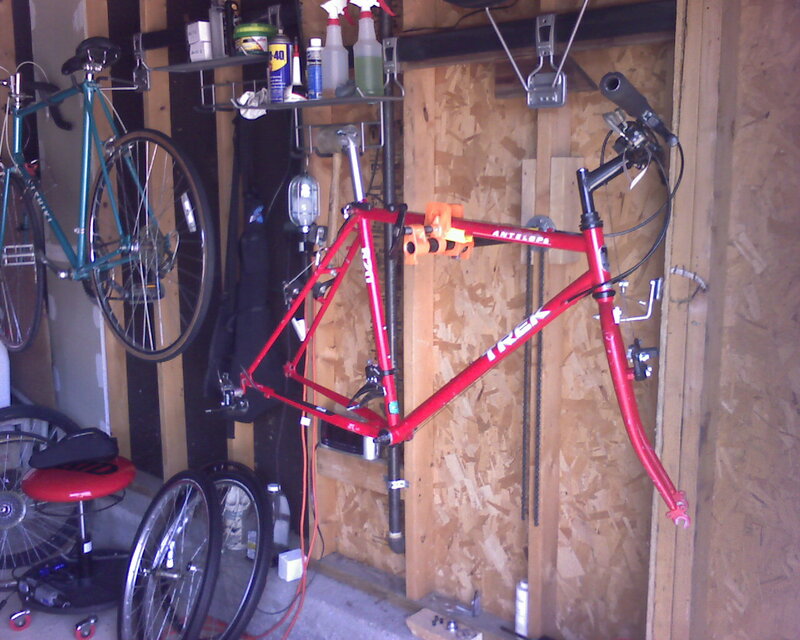 Doing this allows the bike to operate smoothly and safely, regardless of the abuse it has suffered in the past. When it comes to tires and tubes though, we replace them with new rubber. This can become expensive, but it is essential to the creation of a safe, comfortable, smooth riding hybrid bike. Those old knobbys may look fine, but are usually dried out and cracking. Plus, they were the tires which made the bike so difficult to ride in the first place; which caused someone to park it in their backyard and ignore it for so long. As with anything related to bicycles, the cost of new rubber can be about as high as you are willing to pay. However, we have found a couple of sources of relatively inexpensive, quality bike rubber which makes it possible for us to improve the ride of virtually any bike without forcing us into a prohibitively expensive rebuild. We install narrower, smoother tires for a quicker, more comfortable, more enjoyable ride. And, of course, these improvements also make the bike safer to ride. Beyond these things, which allows the bike to function safely and well, we do our best to improve the look of the bike. We do some touch-up of the paint, we polish the wheels and frame, and we clean…and clean…and clean. We do everything possible to make the bike a machine which someone will want to ride. It does no one any good to own a well-functioning machine which is embarrassing to ride. If all they do is take it home and park it, what was the point in rebuilding it? While our vision is long-range, our goal is a simple one; to get more people riding. We would like to see more folks out there experiencing the joy and exhilaration that we do when we ride. We want our neighbors to get the exercise they seek and have some fun doing so. We would like to see them commuting by bike and enjoying the experience. We would like to provide a low-cost, safe, and enjoyable bike which will allow them to reach whatever cycling goals they set for themselves. We believe it’s possible. We believe we are the ones to do this. We enjoy doing it, and we are determined to make it happen. 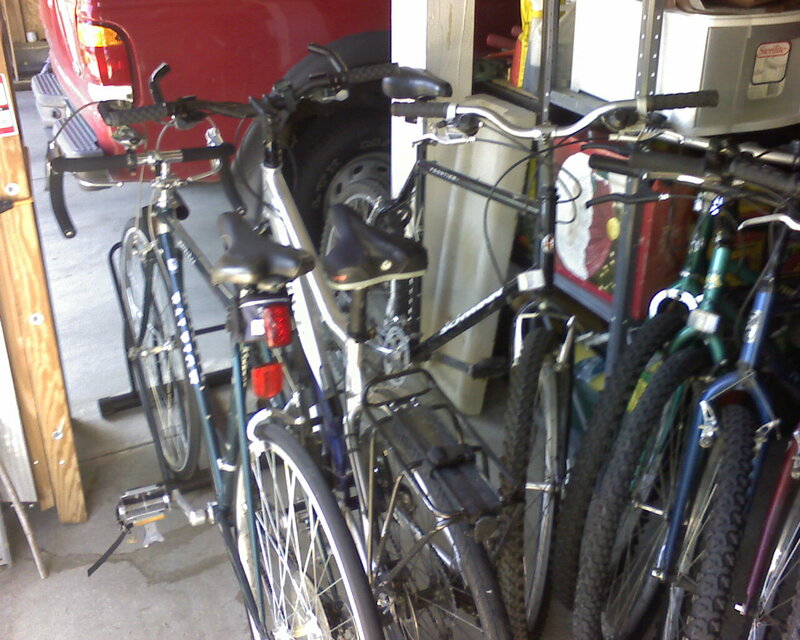 No…I’ve not been on vacation, I’ve been working to control the bikes in the garage, which seem to keep reproducing without much effort on my part. 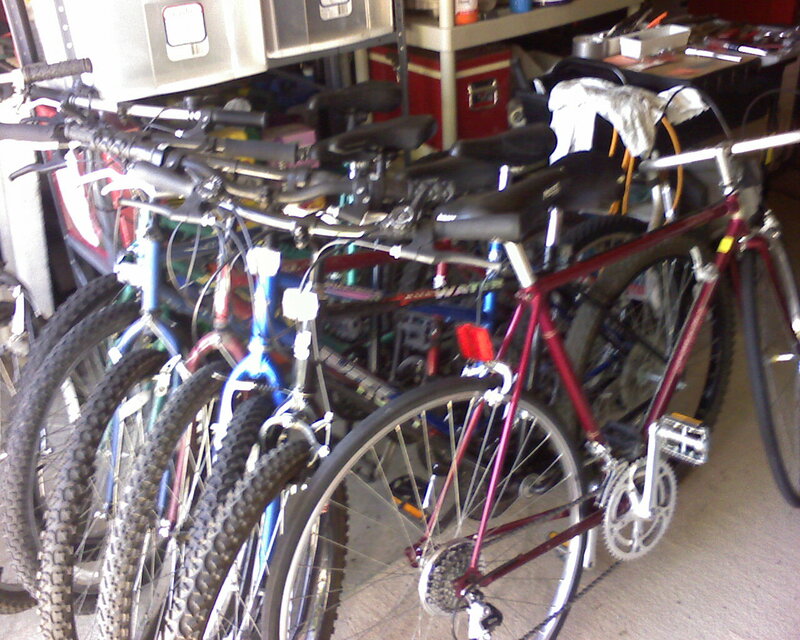 So, we now have 18 bikes to rebuild and hybridize. The more work I do on one bike, the more bikes Andi and Darryl buy for me to work on. These two are out of control!!! Actually, we finished our first “Hybridization” last night. We have two more bikes which will be finished by Wednesday, with two or three more which will probably be done by the weekend. Two of these are promised to a neighbor which will leave us 3-4 to offer to the general public; where we will discover if our idea has merit. You know what? This thing may actually work!